Cardiovascular magnetic resonance imaging is a powerful technology that offers a comprehensive imaging approach to ischemic heart disease. 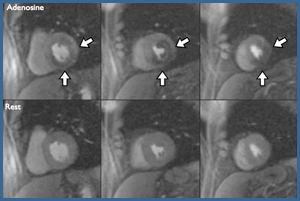 A major focus of our work is on developing clinical applications of cardiovascular MRI. Active clinical protocols include developing a comprehensive MR exam for clinical trials in peripheral arterial disease including atherosclerotic plaque imaging and calf muscle perfusion and energetics at peak exercise. Other clinical studies include quantitative myocardial perfusion imaging in microvascular coronary disease, predicting the development of LV dysfunction from chemotherapeutic agents, quantitative myocardial functional imaging as a measure of dyssynchrony in heart failure, coronary artery and wall imaging, and imaging of left atrial structure and mechanics. The general goal of my lab is to develop magnetic resonance imaging (MRI) techniques for assessing the structure, function, and perfusion of the cardiovascular system, particularly in the setting of cardiovascular disease. While our focus is on imaging in cardiovascular disease, we are also involved in imaging in diabetes and in musculoskeletal disorders. 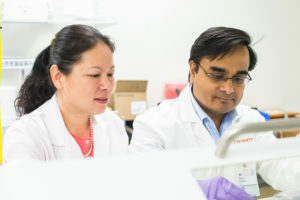 Recent projects have included the development of displacement-encoded MRI for quantifying tissue motion, first-pass contrast-enhanced MRI and arterial spin labeling for imaging myocardial perfusion, molecular and cellular imaging of collagen and macrophages in myocardial infarction, and manganese-enhanced imaging of pancreatic beta cells. We use state-of-the-art whole body 1.5T and 3T scanners for human imaging and a high-field 7T MRI scanner for imaging small animals, particularly mice. Through collaborations with radiologists, cardiologists, endocrinologists, molecular biologists, and mechanical and electrical engineers, the novel MRI methods developed by our group are applied in both clinical and basic medical research. Our research focuses on developing new magnetic resonance imaging (MRI) techniques, especially techniques that acquire the image data very rapidly. This work involves MRI physics, signal processing, and image reconstruction techniques. Rapid MRI acquisition is particularly important for cardiac studies, because of cardiac and respiratory motion. One technique we are studying is real-time interactive imaging, which allows images of the beating heart to be acquired, displayed and controlled in real-time. This technique allows rapid evaluation of cardiac function and rapid scout scans of the coronary arteries. We are currently working to enhance the image frame rate and resolution using new image reconstruction methods implemented on dedicated high-performance Linux clusters. In addition to real-time imaging, we use our techniques to generate high-resolution images of the coronary arteries within a breath-hold. We apply our high-resolution images to noninvasive coronary angiography and coronary vessel wall imaging. My research involves the development and evaluation of novel MRI pulse sequences and techniques to improve the clinical utility of CMR imaging. The current clinical focus of the research is on myocardial perfusion imaging, imaging of myocardial fibrosis and ventricular remodeling following myocardial infarction. The laboratory includes undergraduate and graduate engineering students as well as clinical cardiovascular imaging fellows to bring new advances into clinical practice. 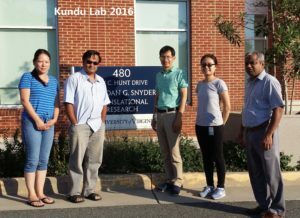 Currently recruiting for graduate students to work in the lab; contact Dr. Kundu at bkk5a@Virginia.edu for more information. Systemic hypertension or aortic valve stenosis can lead to LVH, which is associated with early death and disability from cardiovascular disease. Myocardial hypertrophy is considered initially an adaptive response to stress. With ongoing stress, hypertrophy becomes maladaptive. Hypertrophy and ensuing heart failure are accompanied by changes in energy substrate metabolism which may result in decreased ATP production. During myocardial hypertrophy, there is a shift away from fatty-acid oxidation to glucose metabolism. Based on earlier work from the laboratory, we proposed that this metabolic remodeling precedes LV remodeling in pressure overload LVH and induces the fetal gene program. However, this hypothesis has not been validated in-vivo. The mouse model of pressure overload after transverse aortic constriction (TAC) is a clinically relevant model to assess metabolism, structure and function of the stressed heart in a serial fashion. We propose that identifying metabolic change during LVH and progression to heart failure is now possible because of advances in non-invasive imaging of mouse hearts with small animal scanners. We have developed quantitative glucose transport models with spill-over and partial volume corrections to accurately estimate rates of myocardial glucose influx in normal hearts and hearts subjected to pressure overload LVH. In this project we develop and optimize improved PET imaging techniques to quantify myocardial FDG uptake in mouse heart in vivo. We optimize a model corrected blood input function which is based on a simultaneous estimation of the blood input function with spill-over and partial volume corrections and compartment model parameters by optimizing to blood and myocardial tissue time activity curves obtained from time-resolved high resolution gated PET images of small animal heart in vivo. In this project we describe the use of PET with 18F-2fluoro-2-deoxy-D-glucose (FDG) along with Magnetic Resonance Imaging (MRI) and Computed Tomography (CT) imaging for quantitative evaluation of glucose metabolism in tissues. Insulin resistance is defined as decreased glucose tissue uptake and metabolism in response to insulin and is a hallmark of type II diabetes mellitus (T2DM). Glucose tolerance tests (GTTs) can be performed on serial blood samples to measure the kinetics of whole animal glucose disposal, but GTTs do not provide non-invasive information about tissue glucose uptake, i.e. in the myocardium, liver and skeletal muscle. FDG transport in a compartmental model enables us to measure blood and tissue glucose levels in-vivo and perform serial measurements without sacrificing the animals. Although it is known that glucose disposal is inhibited in T2DM, the kinetics of tissue redistribution associated with T2DM and potential treatments are not clear. Due to the limited intrinsic spatial resolution of the small animal PET scanner, primarily as a result of the higher range of positrons emitted by 13N-ammonia (~1.5 mm), measuring myocardial blood flow (MBF) in vivo in mouse heart is difficult. The image derived blood input function (IDBIF) and the myocardial tissue time activity curve, as a result, in a dynamic PET scan of mouse heart, is susceptible to partial volume (PV) averaging effects and spill-over (SP) radioactivity from the tissue to the blood and vice-versa. Heart motion can cause further image blurring confounding the effects of SP. In this project we will, for the first time, measure MBF in mouse heart using 13N-ammonia PET imaging with SP and PV corrections under rest and stress. The imaging technique will be applied to measure blood flow in a mouse model of pressure overload hypertrophy. The hypothesis that metabolic memory protects the stress heart will be tested in vivo. Pressure overload Left Ventricular Hypertrophy (LVH) is characterized by a shift away from fatty-acid oxidation to glucose metabolism. Identification of these metabolic changes may allow early detection of pre-structural changes and allow more aggressive therapy with agents known to regress hypertrophy, such as ACE-inhibitors, to arrest progressive cardiac myocyte remodeling before structural LVH has occurred. However, the temporal relationship between metabolic remodeling and the development of LVH is inadequately studied. Moreover, the extent to which this metabolic switch is adaptive and has the propensity to become maladaptive is unclear. A better understanding of the relationship between the metabolic pattern underlying LVH and its development may allow the identification and monitoring of novel therapies for LVH. For all of these reasons, the demand for accurate noninvasive imaging of myocardial substrate metabolism that can be performed in small animals and human beings is increasing rapidly. However, current methods of imaging glucose metabolism are inadequate. Measuring rates of myocardial glucose uptake and utilization quantitatively in a compartment model has been inaccurate due to a) partial volume (PV) effects and b) spill-over (SP) of radioactivity from the myocardium into the LV blood pool and vice versa resulting in errors in the measured time activity curves from a dynamic PET scan. We have optimized a novel imaging method in mice in-vivo wherein the blood input function with SP and PV coefficients and the metabolic rate constants in a compartment model will be simultaneously estimated from cardio-respiratory gated dynamic PET images with attenuation correction. The primary hypothesis of this study is that our improved method of glucose-uptake quantification will identify metabolic patterns of myocardial hypertrophy that can detect early metabolic remodeling in hypertensive patients without evidence of structural heart disease.